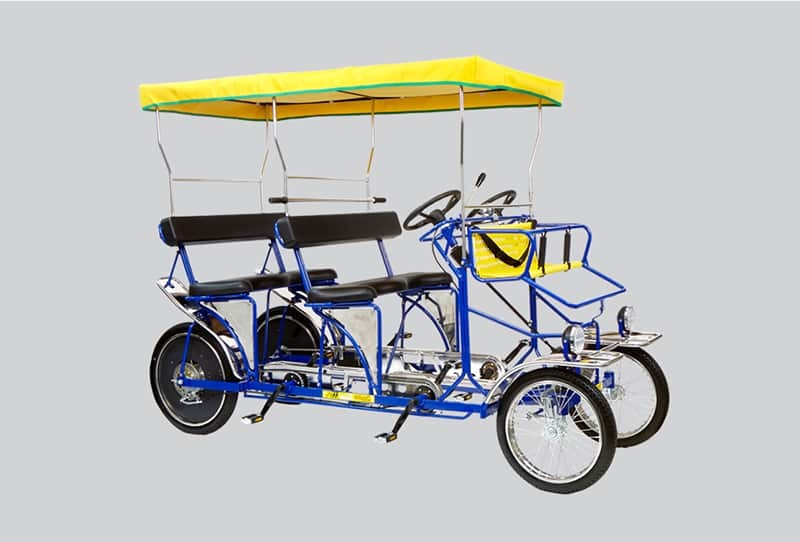 Seats 3 adults (2 pedal) plus 2 small children. 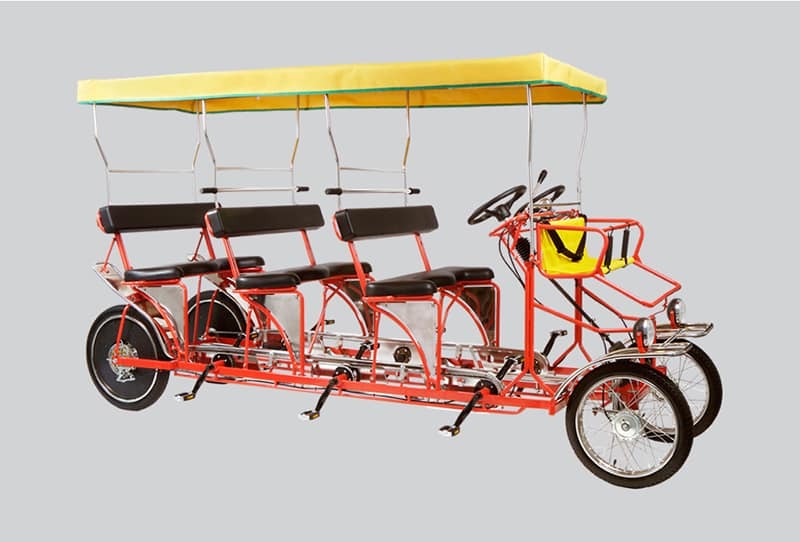 Two benches provide seating for 6 adults (4 pedal), while the front basket seats 2 small children. 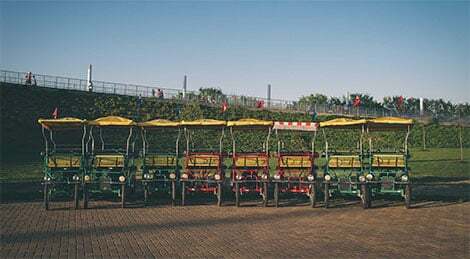 Three row seating fits 9 adults (6 pedal) and 2 small children in the front basket. 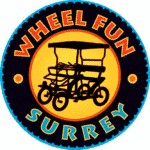 The Wheel Fun Surrey has been the leader in design and quality for over 20 consecutive years. We’ve combined creativity, innovation, and our relentless eye for quality to deliver the best Surrey yet. Our Surreys offer unparalleled reliability with less maintenance than any other. 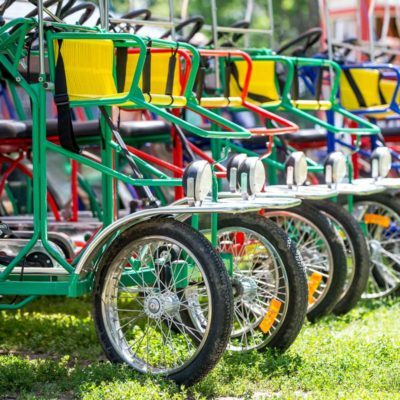 We operate over 100 rental outlets and we channel that experience into better product design – four-wheel Surreys that offer greater safety, less maintenance, and finishes that outlast all others. Maximize your rental dollars with equipment that looks great longer, has less downtime, lower maintenance, and requires less cleaning than any other Surrey available. Further maximize your return on investment when your fleet has both a higher and longer payout. We’re known for better design, superior finishes, and same-day parts turnaround. 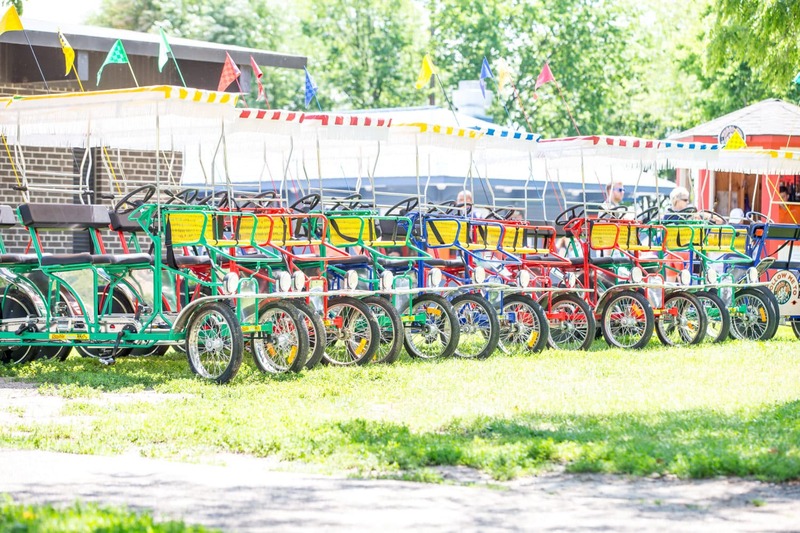 Plus, we include safety features found nowhere else, like dual safety steering boots, all rider independent pedaling, fully enclosed chainguards, wheel covers, and faster-stopping disc brakes. Our team of engineers has created an outstanding value, so we can offer you the safest, highest quality, most feature-filled Surrey on the market. 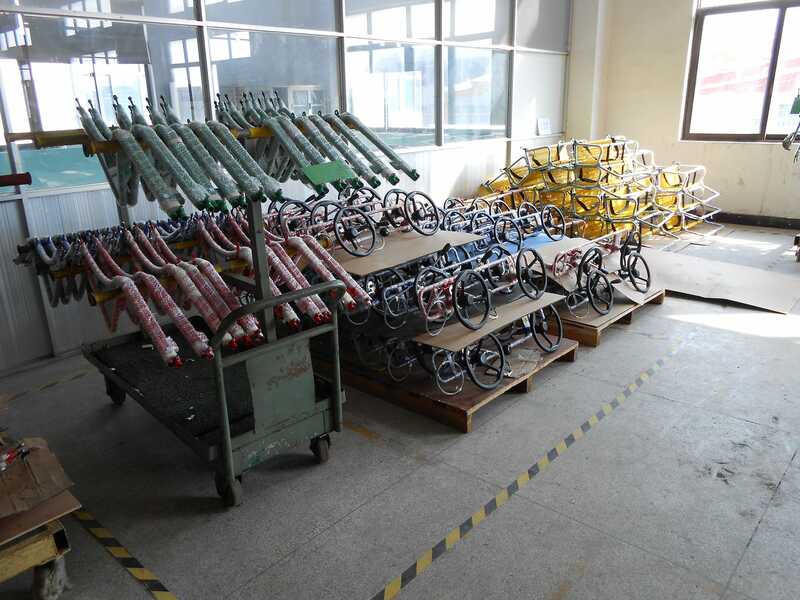 Our quality starts with superior raw materials and continues through rigorous testing of each incoming part. That’s why we can offer the only Limited Lifetime Warranty in the business. 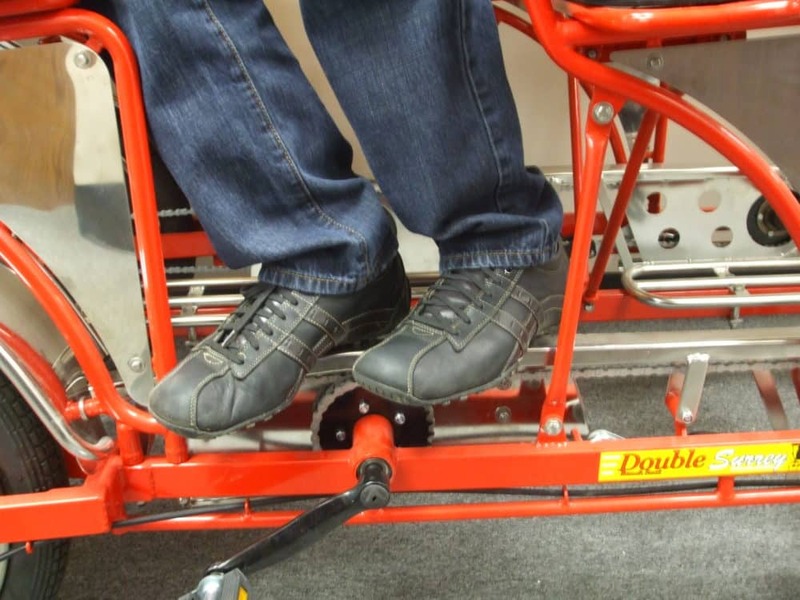 Assure feet won’t get caught in rear wheels offering enhanced safety. Easy to install and remove. Made with unbreakable ABS material. Quick Stop Disc Brakes are state of the art and offer superior stopping power with reduced brake fade and pad wear, which means less adjustments. 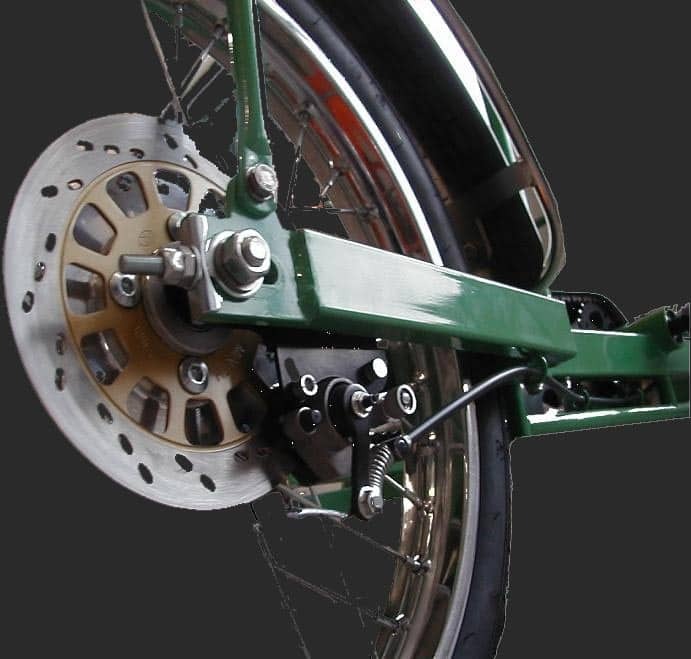 Rotor and caliper attach directly to the wheel and fully interchange with drum style hub. 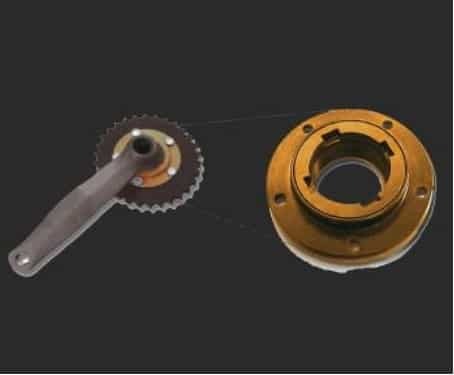 Wheel and brake can be replaced separately, lowering replacement costs. 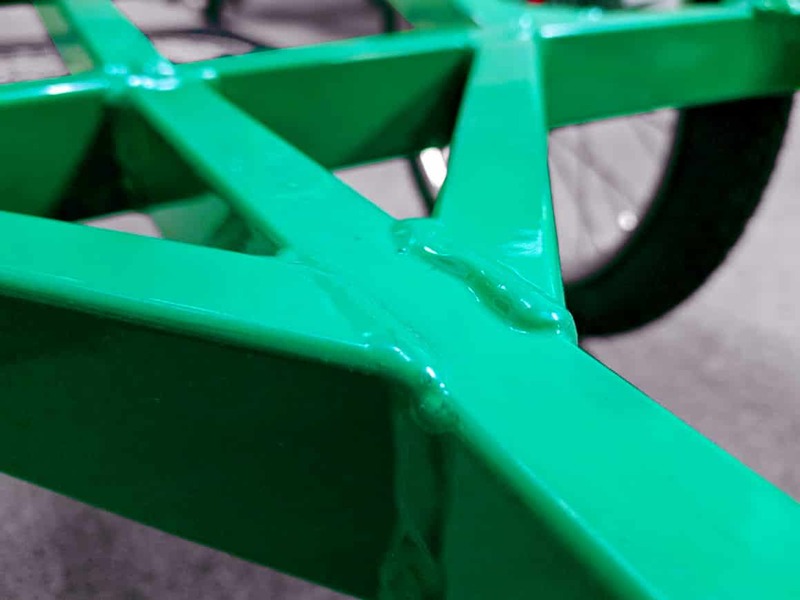 We use Tiger Drylac brand Powder Coat, electrostaticly applied, UV 15 year, baked on at over 400 degrees Fahrenheit. Engineered from the ground up. 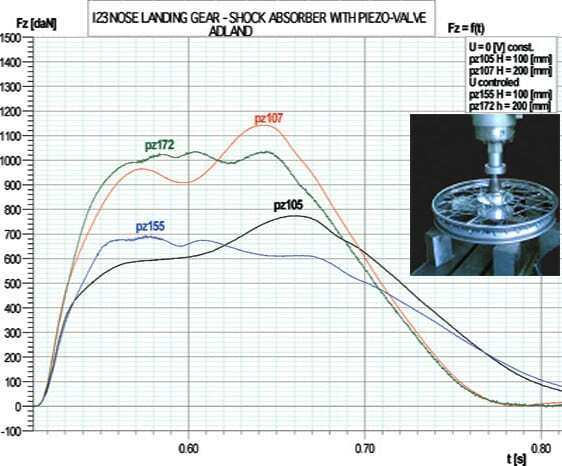 First ever disc brake hub undergoing side load test. Brings comfort and safety and is stainless steel so it always looks great, even after years of foot traffic. 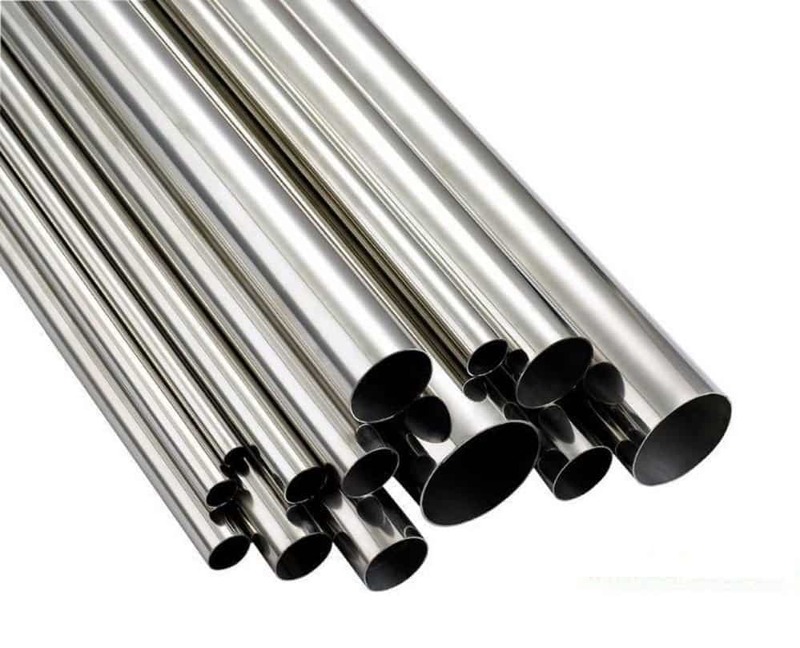 You can stand, in fact you can jump up and down on our stainless steel chainguard - don’t try this on others. Our special rust buster cable housing adds a nylon sleeve to eliminate the metal to metal contact found on all other Surrey cables. 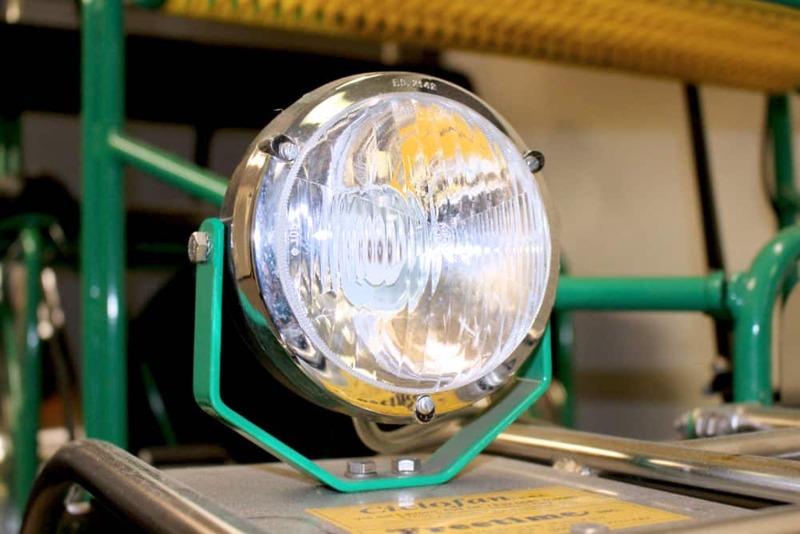 Our lights are battery powered and operate for over 250 hours on one set of AA batteries. Our Superbright Triple L.E.D. headlight retrofits onto all of our past Surrey models. 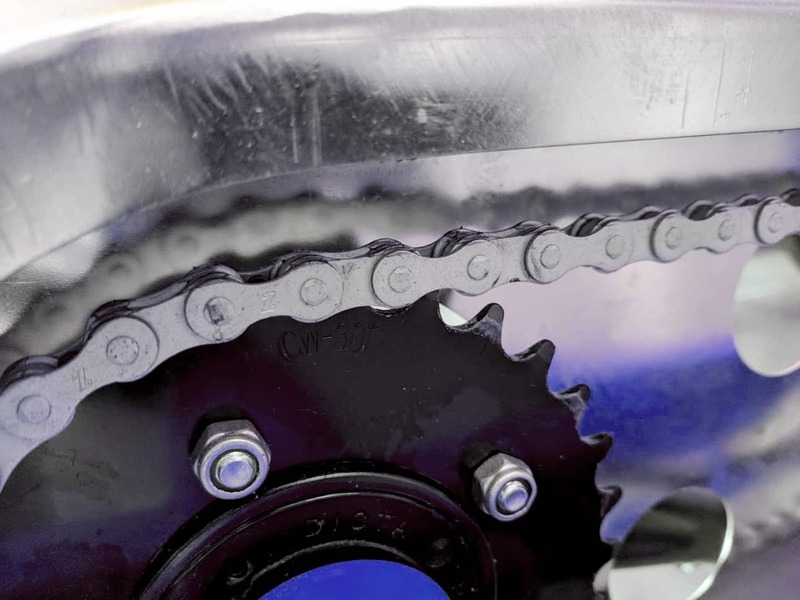 We use a rustless chain designed to carry greater loads (stainless chains and standard bicycle chains used by the other Surrey suppliers do not have the tensile strength to carry Surrey size loads). 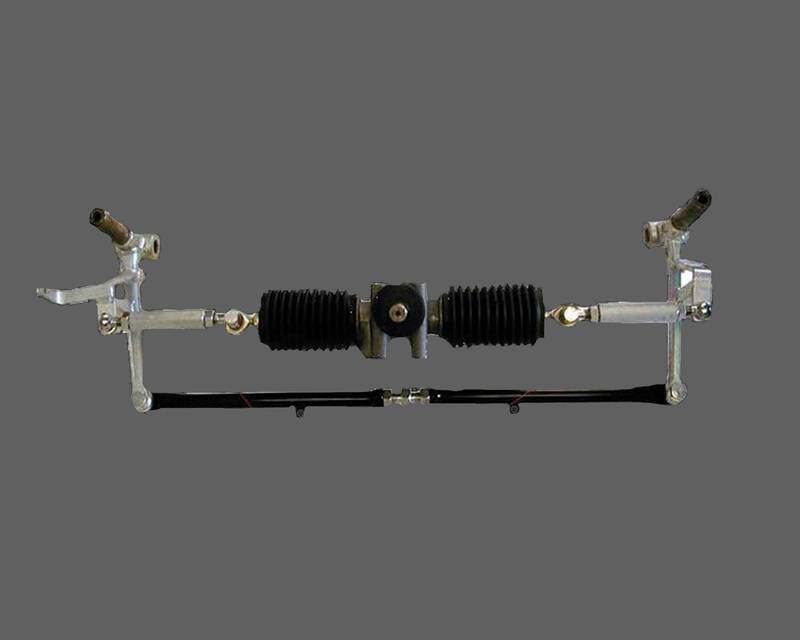 Reduces maintenance time and tire wear. Wheel misalignment is why front tires wear out faster than they should. 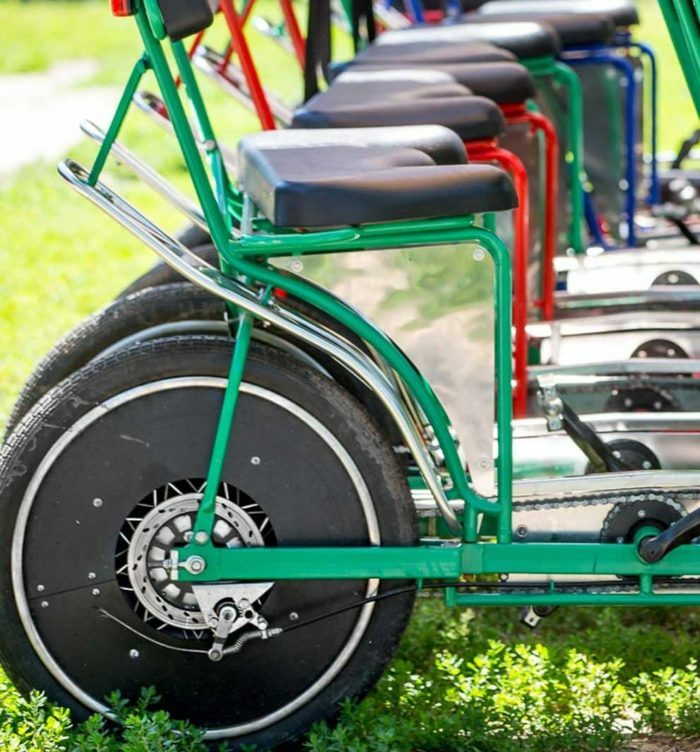 Made possible by our heavy duty Front Freewheel System allows all riders to pedal or coast independently. 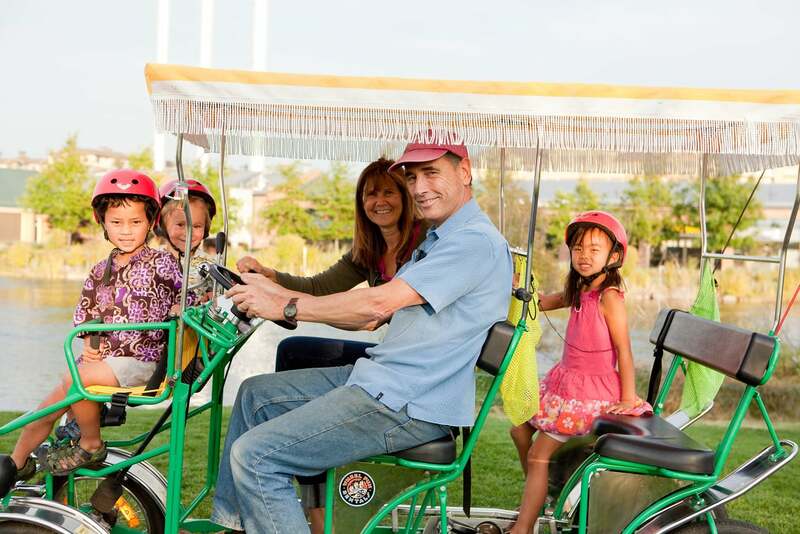 Our Surreys offer greater safety, less maintenance, and finishes that outlast all others. 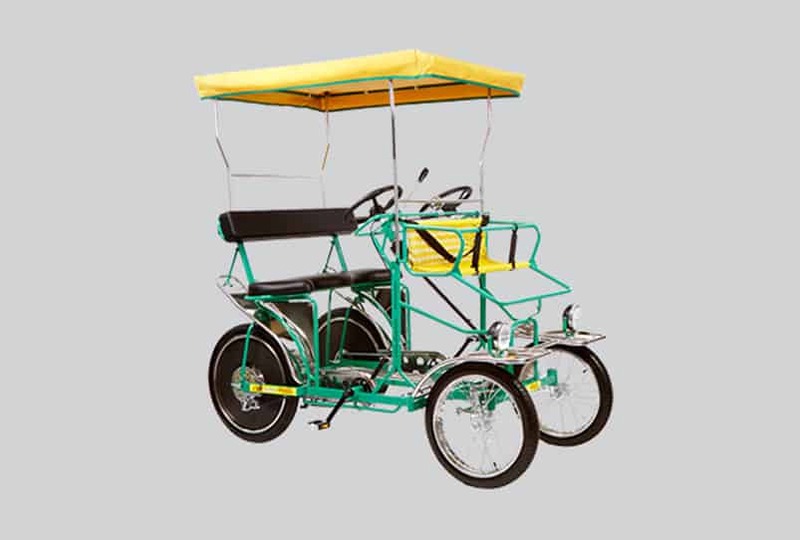 We offer the best value in quadricycle Surreys. We aren’t the cheapest, but our pricing is competitive. 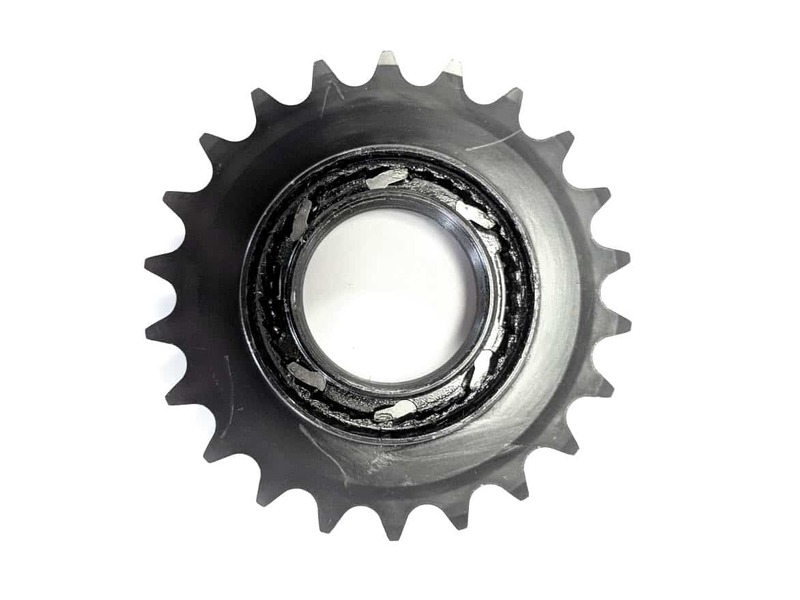 We’re the only Surrey company who’s been selling Surreys and parts continuously for over 30 years. 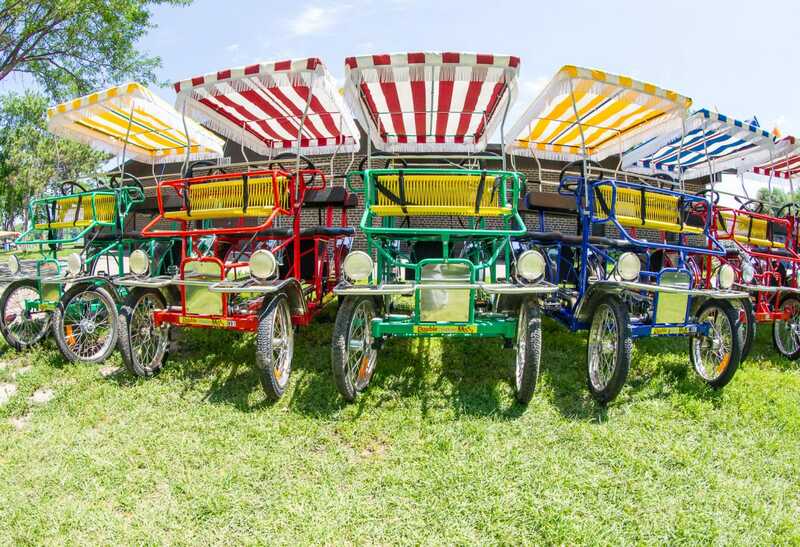 We are the leader in major quadricycle improvements and features tailored to the rigors of the rental market. 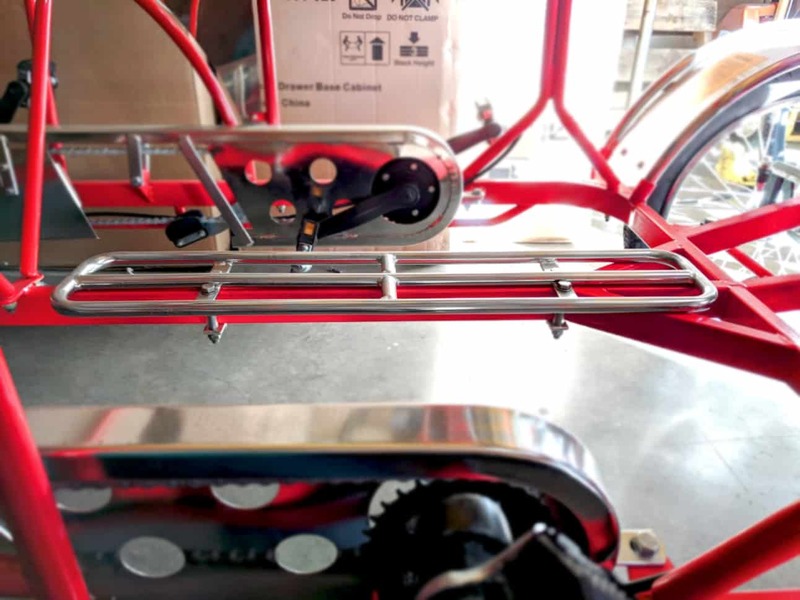 No other Surrey offers as much stainless steel, including chain guards, stainless middle passenger footrests, stainless steel rims, spokes, top uprights, brake levers, bumpers, fenders, side panels and hardware. 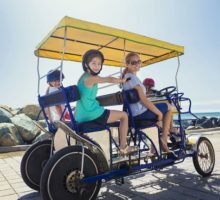 Our Lifetime Limited Warranty covers all Surrey quadricycle parts against any defect in materials or workmanship. We’re the only ones in the industry who offer that level of guarantee. 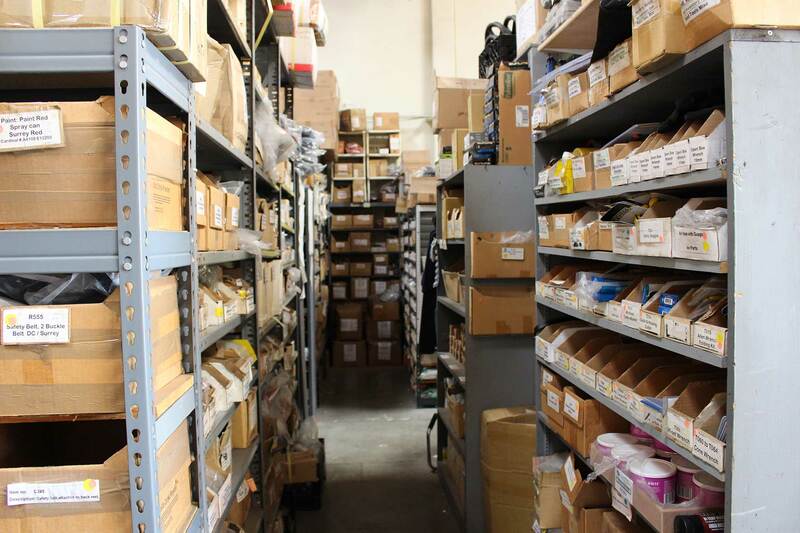 With a 99% fill rate, we stock every part for every Surrey we’ve ever sold, plus parts for Surreys we’ve never sold. All parts are completely interchangeable between our old and new model Surreys. Plus, we ship the same business day. 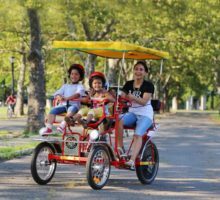 Contact us for a free quote and to learn more about our surrey cycles.